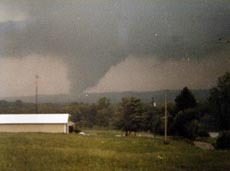 At approximately 6:10 PM on 5/31/85, this tornado struck the Wilson farm just north of Cooperstown PA. Daughter funnels, spun off to the north and south of the main funnel, damaged residences to the north and south of the main funnel; these spinoffs did not touch down and dissipated before crossing Sugarcreek to the east. The main funnel, at F4 strength, crested the ridge west of the Wilson farm and followed a ravine down the east side. The ravine emptied directly into the farm property. Thirteen people were at the farm at the time. There was no warning; regional television stations were broadcasting "Tornado Watch" banners - not warnings, and no sirens sounded. The F4 struck the farm directly. The mobile home residence on the west side of the property was the first structure hit and was completely disintegrated. The i-beam frame components were later found wrapped around tree trunks like pipe cleaners. For the people in and around the mobile home there was nowhere to hide, and many suffered severe injuries. One person was killed by flying debris. The tornado then destroyed the unoccupied farm house and barn, trapping the cattle under the debris, killing many outright before continuing across State Route 427 and into empty fields on its way east toward Cranberry and the trailer park there where many died. A wastewater storage tank from the property's natural gas well was found 0.3 miles east of its original location. A Chrysler K-car sedan, driving north on RT427, was picked up by the funnel and deposited 400 yards east of the road in a corn field; the car was flattened, but its occupants were virtually unharmed. Months later, the farm's owner received a package in the mail from Potter County in north-central Pennsylvania containing documents of his that were blown there by the storm. I was a direct witness to the storm. I lived just south of the farm and was preparing to go out with friends when the tornado hit. Our house was at the foot of the western ridge, and my mother was nervously watching the sky above the ridge. She was extremely worried about the weather and urging me to cancel my plans, but that was nothing new. My father came home around 5:45 and took me aside to tell me that there was ominous rotation in the clouds to the west, but we thought it was just a normal thunderstorm. Just before the funnel hit, my mother started screaming hysterically. I ran to the rear of the house, looked up over the hill, and saw mature trees flying high up in the sky. In those days the conventional wisdom was to open the windows to prevent "negative pressure" from exploding the house, and I did what I had been taught - I ran to the front of the house to open my bedroom window. Just as my hand touched the sash, every tree in our yard fell to the southeast like dominoes. There was a line of huge 50-year old pine trees just north of the house, and the front yard had numerous large maples, cherries, and pines. All of them, in an instant, hit the ground, pointed southeast. Just across the road was a large oak tree, which strangely and fatefully fell to the west - directly into our yard, completely blocking the road and later preventing emergency vehicles from reaching the Wilson farm. With the trees out of the way, I was able to see the F4 funnel as it crossed the fields and scaled the ridge to the east, out of sight. I also saw a smaller funnel passing directly over our house headed east; this funnel retracted into the clouds a few hundred yards east of Sugar Creek. I was under the impression that this tornado tracked a bt further north than this, hitting Atlantic and Cochranton directly and had 23 fatalities. I would like to know why there is such a discrepancy regarding the death toll. Tornado History Project lists this tornado with a death toll of 16, but others list it with 23 deaths. A difference of 1 or 2 I might understand, but not a differnce of 7 deaths. The death toll of 16 is correct. 8 deaths in Crawford County, and 8 in Venango County. The differences of 7 is from the tornado that hit Tionesta PA in Forest County. Although I have come across sources that list the figure as 23, these sources combine the two storms into a single long tracked tornado, even though storm surveys afterward determined that the tornadoes were seperate. The torando passing near Jamestown. The remaines of trailers from the Pinedale Trailer Park, which was just outside of Atlantic. The frames were thrown hundreds of yards away and mangled. What was left of the Pinedale Mobile Home Park that was just west of Atlantic. The tornado as it was passing through Cochranton. An Amish farm house near Atlantic that was flattened.